NoSpamProxy Protection offers proactive, real-time protection against spam, ransomware, malware and spyware. NoSpamProxy® Protection scans every single email as soon as it hits the first SMTP gateway, ensuring complete protection against spam, ransomware, spyware and malware. NoSpamProxy classifies the email using a variety of anti-spam filters. Spam emails are rejected reliably. Only emails that are classified as neutral or trusted are allowed to pass the anti-spam gateway. In addition, should a trusted email not be accepted for some reason, NoSpamProxy Protection will inform the senders about the rejected email. There is a wide choice of anti-spam solutions available on the market. What makes NoSpamProxy stand out? NoSpamProxy is one of the few anti-spam solutions compliant with challenging German laws (particularly in accordance with §206 of the StGB [Criminal Code] and §88 of the Telecommunications Act). The legal consequences that may arise from just receiving and accepting emails at the company’s email gateway are avoided. In addition, damage claims based on emails stored in quarantine folders cannot affect NoSpamProxy users. A high level of productivity and maximum protection with minimal operating expenses also distinguish NoSpamProxy from other solutions. In most cases, these expenses will be amortized after just a few months, especially in Microsoft Server-based IT environments. The problem common to all spam protection solutions is that the software decides whether an email is classified as spam. In many cases, not all spam emails are detected, or uncontaminated emails are accidently blocked (false positives). 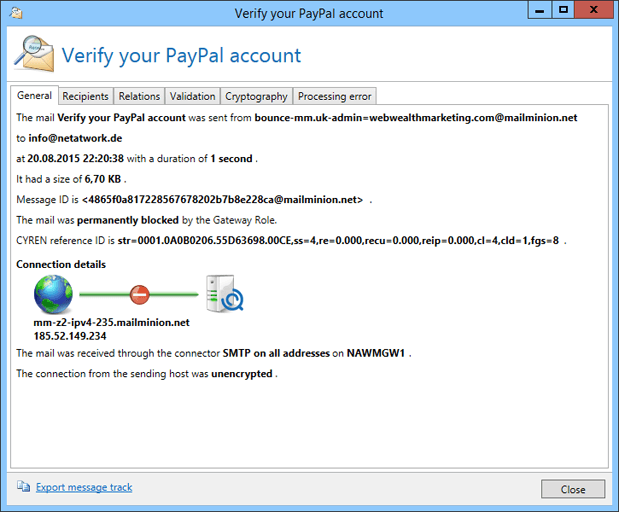 These false positives are a huge threat for companies and a weakness in many conventional anti-spam solutions. If such emails are deleted or stored in a quarantine folder, it is nearly impossible to locate them once they have been quarantined. If NoSpamProxy Protection mistakenly classifies an email as spam and subsequently refuses to accept it, NoSpamProxy will inform the sender that the email was not delivered. The sender can respond by either calling the sender or requesting the email to be resent. NoSpamProxy’s Level of Trust capability is then addressed to ensure that emails from this sender will be accepted in the future. Spammers will cease to use the recipient’s address because of the additional effort neccessary to exploit it. Another advantage of this is that the spam volume for NoSpamProxy-protected domains significantly decreases over time. The powerful reporting capabilities of NoSpamProxy Protection allow you to keep a constant eye on your email traffic. The volume of data as well as emails and spam can be analysed in detail. 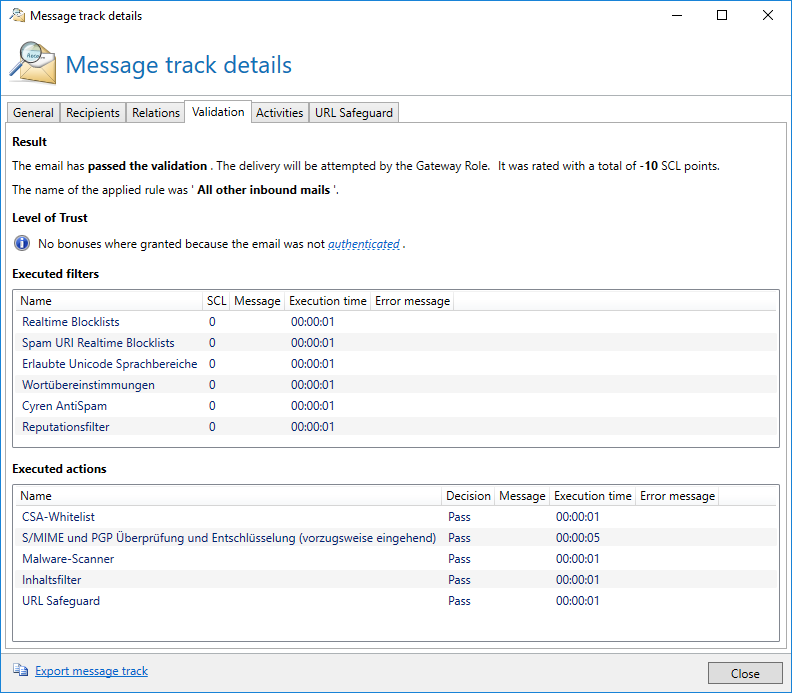 The integrated message tracking function creates log files for every single email, including information on how the email has been processed. Also, information on rules and anti-spam filters applied as well as actions carried out are stored. The records and reports created by NoSpamProxy Protection allow administrators to constantly and easily monitor all notifications. 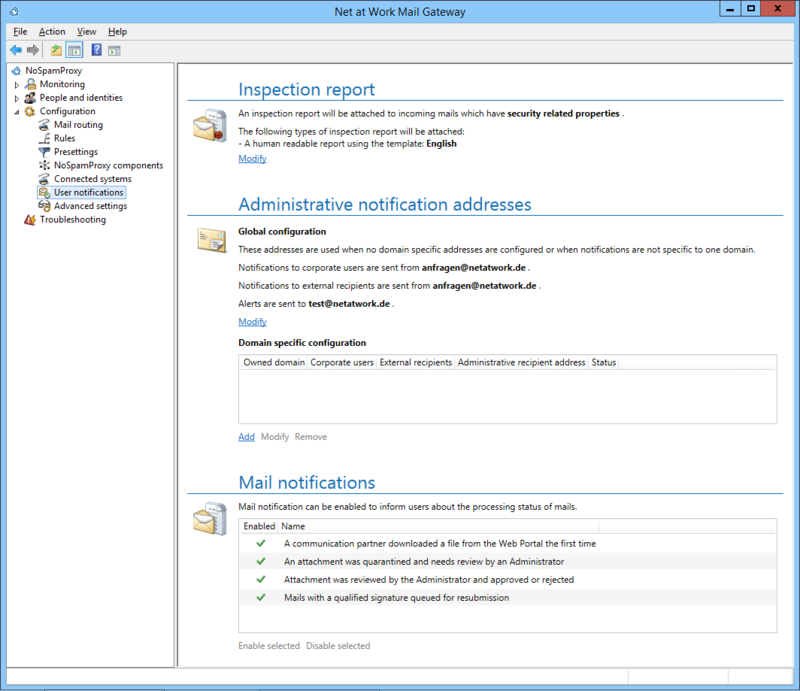 Implementing company-wide email policies with the rules editor. 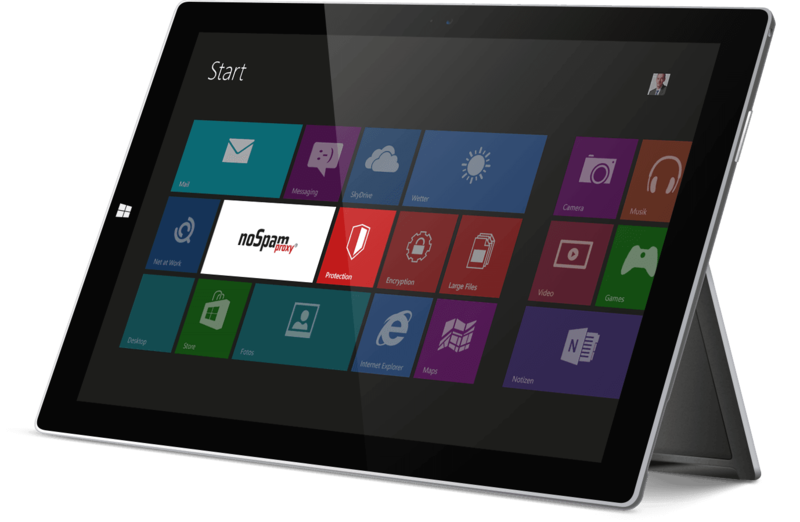 Centrally, simply, Active Directory-controlled. Granular specification of rules allows for easy implementation of exceptions. Assigning filters to rules allows for maximum flexibility. Assigning actions to rules for increases flexibility. 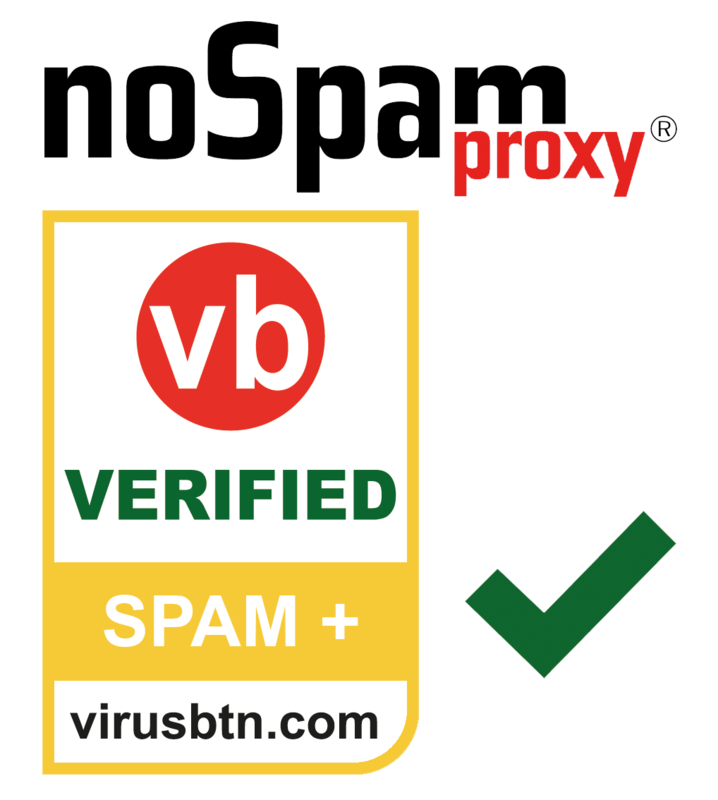 With a score of 99.99 out of 100, NoSpamProxy has earned the prestigious VB Spam + Gold rating for IT security. NoSpamProxy Protection is continuously getting to know your communication habits; emails from these partners will not be rejected, even if certain properties indicate that these emails are spam or ransomware. This is made possible by NoSpamProxy’s Level of Trust capability, its Sender and Recipient Management System as well as its Smart Attachment Management, three features unique to NoSpamProxy. If a communication partner is mistakenly identified as a spammer, a single email sent suffices to instruct NoSpamProxy’s Level of Trust capability to allot trust points to the partner who will subsequently be accepted by NoSpamProxy. The time and effort required by IT administrators to manually update whitelists on Microsoft Windows server – a typical scenario when using conventional spam solutions – is no longer necessary. Trusted communication with trusted partners NoSpamProxy Protection scans outbound emails and assigns so-called trust points to the recipient of the email. Over time, these points are aggregated to build a database used to allow inbound emails to pass – provided a communication relationship exists. This also applies to cases in which other spam filters would classify this email as not trustworthy, for example because the sender is on a blacklist. To guarantee the highest possible degree of security, NoSpamProxy applies a combination of nine different tests on all emails and email attachments. The tests for compliance with SPF, DKIM and DMARC protocols make it possible to verify the authenticity of the email sender and to react appropriately in case of an attack. The nine tests carried out by NoSpamProxy are then combined with the Level of Trust filters, a technology based on self-learning and dynamic white listing. An important potential for combating malware is the handling of email attachments. For this purpose, NoSpamProxy contains a function that allows rule-based attachments in Word or Excel format and can be automatically converted into uncritical PDF files. Any potentially existing malicious code remains unaffected. The recipient is thus guaranteed to receive a non-committable attachment. The PDF document contains a preview page, which contains individual notes on the reason for the conversion and, if desired, a link to the original document, which is in a special quarantine. Everyday, cybercriminals produce millions of spam emails to spread malware and ransomware. Malware software, in turn, is used to misuse infected PCs for generation of endless amounts of spam emails. To fend off these combined threats, NoSpamProxy Protection with Zero-Hour ™ Outbreak Protection Technology offers real-time protection against viruses. Instant protection against threats such as Emotet, WannaCry, Locky and more Cyren Zero-Hour Technology is the ultimate proactive anti-spam technology, offering instant protection against viruses, ransomware, malware and spyware. It is based on Rapid Pattern Detection™ (RPD™) technology which already protects more than 600 million users worldwide. This is made possible by patented Cyren technology which examines a large amount of the global Internet traffic in real time and analyses more than two billion messages per day. Spreading patterns and structures of viruses, malware and phishing activities are identified instantly and used by NoSpamProxy Protection as part of its anti-spyware and anti-malware components as well for fending off phishing attempts and spyware. Immediate use of newly discovered virus signatures NoSpamProxy Protection integrates Cyren Zero-Hour Technology and proactively scans the Internet to identify potential virus outbreaks in real time. Unlike signature-based approaches, NoSpamProxy recognizes new virus outbreaks as soon as they occur and protects your Exchange server and email infrastructure within the first hour of the attack.